The most relevant content for you. Over the last months the Utopic team has been hard at work on a new shiny version that we launched today. Based on your feedback we now mix visual bookmarking with social content discovery. With one click you can now save, tag, share and later quickly recover anything on the internet that you find interesting. The same goes for your favourites and links already shared on social networks. Utopic allows you to automatically import and publish those links in a beautiful visual profile. Topic-based content discovery through other people sharing your interests is still there as well, albeit with a new design and navigation. 1. One-click bookmarking. You get browser extensions to quickly save any web page to Utopic with just one click. All your links are automatically tagged (manual editing is super-easy!) with keywords to categorize and find them fast later. 3. Aggregating links and favorites to your public profile. Your Utopic profile now automatically collects and publishes all the links you’ve shared or favourited on Twitter, Facebook, Youtube and Google Reader (with more to come). All the links you have saved in Utopic are there as well. Your Utopic profile of shared items is a great way to present yourself as a person. So go and promote it to your friends and others. Save. Share. Discover. This is what new Utopic is about. For some background reading, here is our blog post describing the changes from a few weeks back. Please go to http://utopic.me/ now (you can get the browser extensions after logging in), check out the new Utopic and give us some feedback on your first impressions, either here or via e-mail to hello@utopic.me. We are glad to have you using Utopic. During coming weeks you’ll see a lot change at Utopic. Here’s heads up on what to expect. Based on our users feedback, first there’s going to be easy bookmarking and later quick searching and browsing of saved items from you, your friends and people sharing your interests. The other new side is aggregation of all of your shared links and favorites from other sites to your Utopic profile. In addition the whole site will get a shiny new design, better navigation and easy to use content discovery. The main new focus area is social bookmarking and visual link sharing. Many people have told us they are unhappy with current browser bookmarking and existing social bookmarking services. Utopic will be the best place to collect and visually share all your bookmarks, links and favorites. We’ll provide easy one-click bookmarking and keyword auto-tagging of anything you find on the web. Be it any article, blog post, news item, music video or photo, a click on our bookmarklet or browser extension will save it to your Utopic profile and share it in your friends Utopic homepage feeds. You’ll also be able to import your existing browser bookmarks or external services like Delicious, Instapaper or ReadItLater. We really want Utopic to be the best social bookmarking service out there. Let us know, what your biggest gripes with current bookmarking and sharing is and we’ll try to come up with a solution. We’ll group all objects by automatic keyword tags, so looking at someone’s profile you’ll see at a glance what the person is about. Everything on a profile will be also broken up by content types: links, videos, photos, music and so on. We’ll add many other external services in the future, basically everything where you either add, share or favorite something. Think Google+, Soundcloud, Flickr and many others. Many of the features you currently use at Utopic are not going anywhere, but they’ll get a new design and easy to use navigation. Our homepage will get better grouping of content from your friends, people you follow and your interest keywords. We’ll break everything into groups by keyword tags or by content types. At any moment it will be easy to read just about technology or about funny jokes, watch just videos or listen to music. Utopic content discovery is not going to disappear. We will be giving more importance though to content from people you consider important or influencing on any topic. 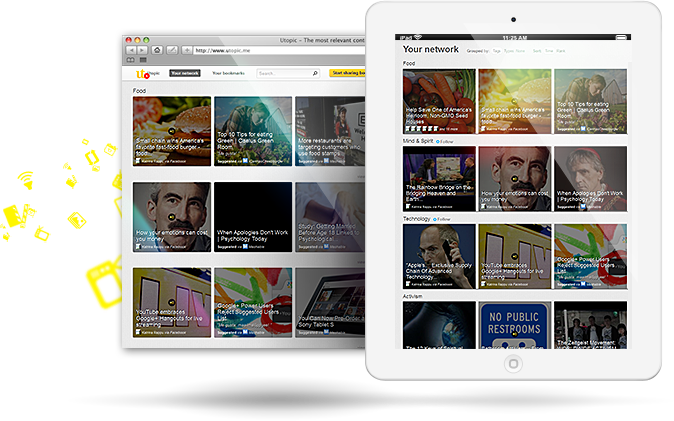 Thought leaders of specific areas will be presented much better as featured users to follow. Expect these changes to go live in a few weeks. Hope you are as excited as our team. As always, feel free to share your thoughts here or via e-mail to hello@utopic.me.